There is no clear winner at this point. Lots of cities are coming up with different initiatives. London is leading the way in terms of publishing open data feeds and enabling startup ecosystem to solve problems for citizens. Transport for London has 80 different transport data feeds. There are more than 600 apps powered by this data, and they are used by as much as 42% of Londoners. A recent study indicates that this ecosystem contributes £130 million a year to the London economy. Another good example is Stockport Council’s latest Signposts initiative, which has data at its core. Signposts is a communicative bridge between social workers and the wide variety of agencies working locally in child protection, for example schools and Greater Manchester Police. Via Signposts, social workers now have a single view to access background information about young people and families in a safe and secure way. By building this end-to-end journey, more relevant data held by police and other agencies is accessible to support decision making. The simple visual interface allows professionals to spot patterns and quickly get a feel for issues and risks that are faced by a child or family. How can citizens, enterprises and the government work together to achieve success? As citizens, we often see inefficiencies when it comes to government services. In the Private sector, many companies have embraced human centred design and design thinking. Through this collaborative process that puts the user at the centre of the design, companies achieve better outcomes. If service creators engage citizens when trying to solve the biggest challenges that we are experiencing in cities today, we are likely to see more creative solutions that actually impact the lives of citizens for the better. With a significant rise in data leaks and security flaws, fueled by a rapid increase in connected devices and the Internet of Things and the volume of data that we are producing, security and privacy is more important than ever. ThoughtWorks is part of a consortium group under NESTA called Decode, where we are using the principles of the City as a Platform (CaaP) building an infrastructure with security and privacy as first class citizens, with a decentralised architecture. This model gives people ownership of their personal data. This model is focused on privacy and democracy, before technology, vendors and “owners” of the platform itself. By starting with the end user and beneficiary in mind, we stay true to the purpose, rather than the owner. The platform allows users to manage their data, including sharing it anonymously for the public good. In Manchester, a group of passionate ThoughtWorkers wanted to show the huge opportunity that exists once city related data is available for processing. In less than six weeks, the team brought Tramchester to life, an award-winning mobile app that models Manchester’s tram network using available data and a graph database. It calculates the best route between two tram stations using a path finding algorithm. The technology behind this app means that Tramchester quickly processes data and is ready to face the future of more complex transport demands. We expect the hype around digital cities to continue to grow and evolve. 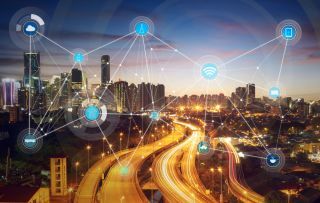 But rather than a single master digital city plan, the future will result in a number of interconnected solutions that work together cohesively. We must protect our citizens and build a model that doesn’t give one powerful entity to be the master of the digital city - it should be a combination of local authorities, large companies, SMEs and third sector organisations sharing data securely and working together to solve the future’s problems.